The last novel and late-career manifesto of Pulitzer Prize winner Carol Shields gets a visceral but disjointed adaptation in Alan Gilsenan’s Unless, which, like its source, follows the mysterious transformation of Norah (Hannah Gross), a college student who suddenly goes silent and abandons her life of middle-class comfort to camp out on the street with a cardboard sign that says “Goodness.” The Irish documentarian puts a conspicuously realist stamp on the lyrical and philosophical novel, nobly attempting to pin down a wispy, not especially cinematic narrative that otherwise might wash away in the voiceover’s dissertations on happiness and grief. Gilsenan rises to the challenge of rendering the novel’s recognizable downtown Toronto setting uncanny to anyone who’s been there. Norah’s solitary experiences on the street are poetically vague for the most part, lacking the authentic grain of Benny and Josh Safdie’s Heaven Knows What (2014), and reducing the presence of actual homeless people to one dancer who briefly crosses Norah’s path, immediately doomed for being a person of colour in a story about the unbearable wokeness of sensitive white people (more on that to come.) 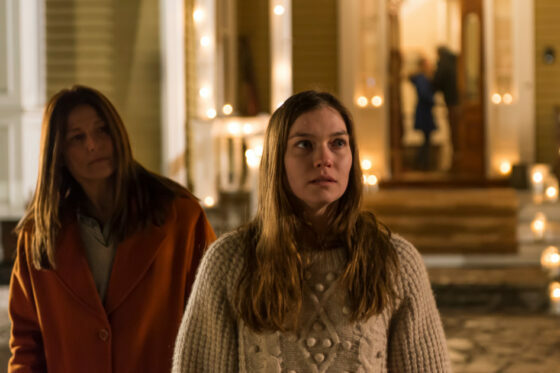 But Gilsenan’s understated nighttime photography and immersive sound design go some way toward capturing the sensory overload experienced by Norah’s novelist mother Reta (Catherine Keener). Reta’s efforts to find a parking space near kitschy discount store Honest Ed’s and locate her daughter amidst thick pedestrian and vehicular traffic alike are charged with genuine peril, suggesting that the film might at any moment turn into a thriller about the horrors of parenting. Unfortunately, all it turns into is a confused but mostly faithful translation of Shields’ novel, which starts in a place of productive ambivalence and gradually narrows into a tidy lesson about integrating other people’s unspeakable traumas into our own triumphant life stories. As useful as his outsider’s eyes are for rendering Toronto as a place of danger to vulnerable bodies, Gilsenan isn’t so sensitive to the novel’s specific gripe against the patriarchal dismissal of women’s stories as hopelessly minor in Canadian literature, a premise both Reta and Shields’ work resist at a formal level, but which Gilsenan’s only describes. Failing to articulate the feminist argument that sets the novel apart, if anything does, Gilsenan is instead doggedly loyal to Shields’ worst impulses, even if it means recreating a denouement that buries another precarious person of colour to set its white heroes more squarely down the path of self-discovery.